three − three = Required Please enter the correct value. 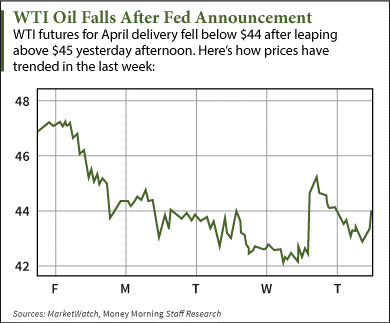 How much is a barrel of oil, 3/19/2015: Oil futures fell back today after swinging sharply higher yesterday in response to the Fed's interest rates announcement. At 12 p.m. today, WTI oil prices were down 2.11% at $43.72. WTI gained 2.78% to $44.67 a barrel just minutes after the Fed released its statement Wednesday. Brent oil futures were less volatile, losing 1.79% to trade at $54.91 a barrel. The London benchmark saw a massive leap yesterday, up 4.86% to $56.11 a barrel by late afternoon. In its statement, the Fed indicated that it will make its first rate hike since 2006 this year – but at a slower pace so it can gauge economic improvement. The U.S. central bank took back its pledge to remain "patient" about raising interest rates, which have been near zero for seven years. "The committee anticipates that it will be appropriate to raise the target range for the federal funds rate when it has seen further improvement in the labor market and is reasonably confident that inflation will move back to its 2 percent objective over the medium term," the statement explained. All major U.S. indexes reacted positively to the news. The S&P 500 rose 1.1%, or 22 points, with energy and utilities being the highest-gaining sectors. The Dow Jones jumped 185 points, or 1%, losing 101 points before the Fed's statement. And the Nasdaq Composite increased by 0.8%. According to Money Morning's Global Energy Strategist Dr. Kent Moors, this isn't just a knee-jerk reaction by oil prices. In fact, he sees oil costing about $70 a barrel by the fourth quarter of 2015. How Will the Price of Oil Rise in 2015? The answer is simple – supply and demand. While demand continues to rise, oil companies are actively tightening their supply. Combined, these market forces will gradually restore equilibrium in the oil market. The rig count is shrinking more and more each week as companies respond to low prices.